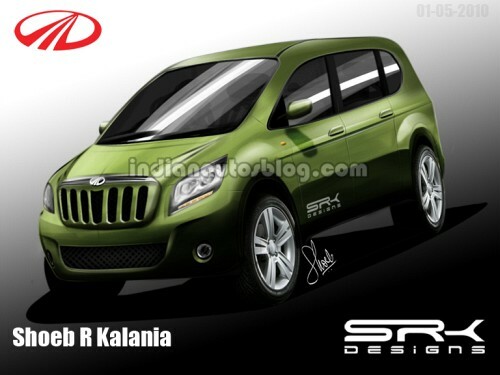 Post the mini Xylo (see 10 comprehensive spyshots) and the sub- 4 meter Verito, Mahindra will bring out a Nano SUV priced between 3.5-4.5 lakh rupees, Business Standard has reported. Designing a car that's under four meters long drags down the excise duty from 22% to 10% giving the product a new value proposition. The new SUV (codename - S101) will duck under four meters. A few years back there was a talk in the public domain of a Scorpio junior and Mahindra, it seems, has listened closely. The mini Xylo expected in the next few months will sport a 1.5-liter 3cyl diesel engine producing 70hp/160Nm. This engine will carried over to the S101. The S101 could also be strapped with a compact petrol engine displacing under 1.2-liters. Mahindra will sell the regular Verito and the compact Verito in the market. Both these models will receive cosmetic overhauls to pose as new products. After the acquisition of REVA, Mahindra has the option of doing EV variants of these cars. Though India is not ready for these vehicles in the near term, it could look at countries that are developing the infrastructure for electric cars to export them. Mahindra is also finalizing plans to launch the two Ssangyong products Korando C and Rexton in India. These will be assembled in India using kits shipped from Korea. The Mahindra office must be an ant hill where everyone is busy all the time!